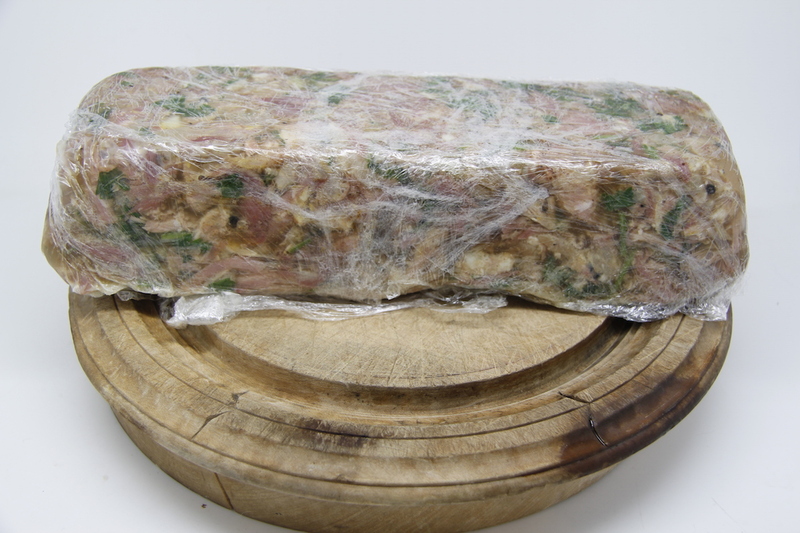 Eugine Panevin (genie_187 on Instagram) made a lovely looking hock terrine and kindly provided me with the guidelines. 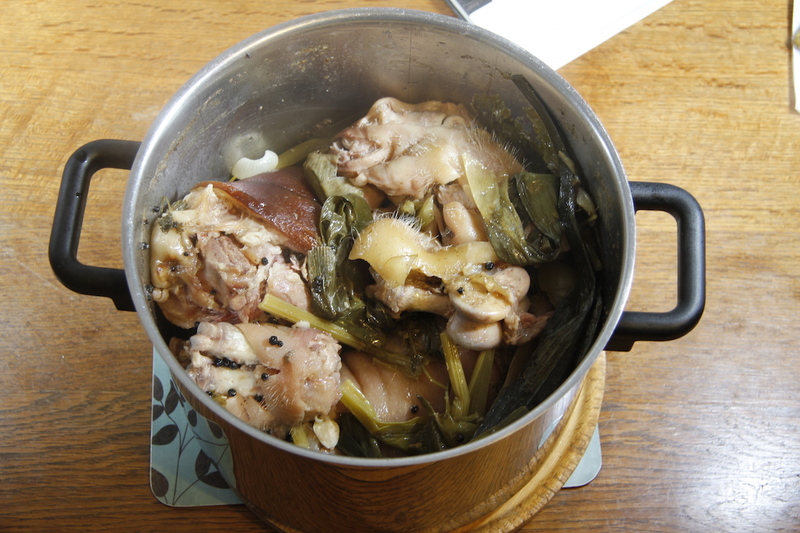 I happened to have some hocks and trotters in the freezer and veggies in the garden so set to work. 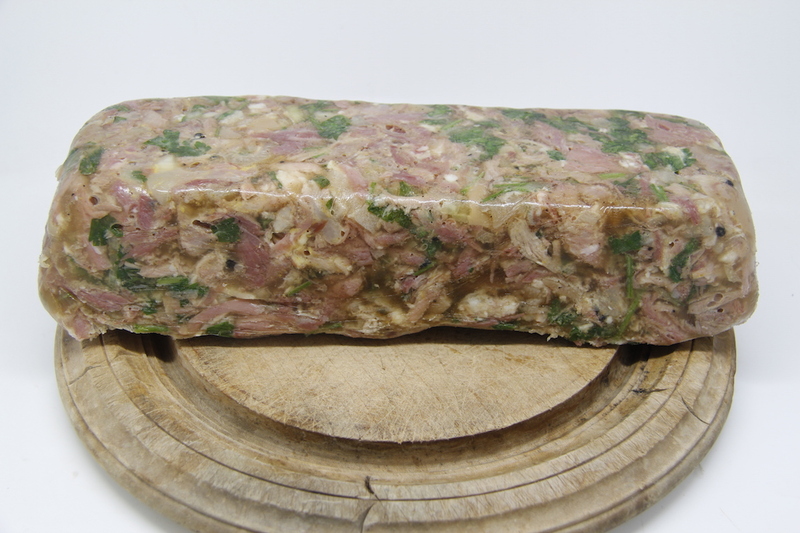 Smoked Ham Hock and Parsley Terrine: three trotters, two ham hocks (I used one smoked and one unsmoked as that is what I had), 2 leeks, 1 onion, 3 carrots, couple of sticks of celery, handful of black peppers, parsley – big bunch, garlic bulb, 2 litres of chicken stock (I used a mix of chicken and ham stock), mustard, 3 bay leaves, seasoning, spices. 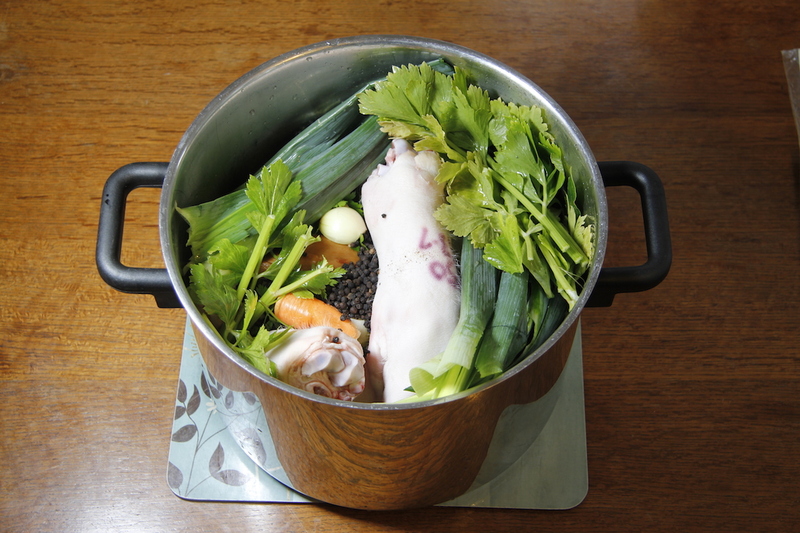 Put the trotters, hocks, stock, leaves of the leeks, carrots, onion, garlic, celery, bay leaves, black peppers and some of the parsley in a massive stock pot. Top the stock up with water so everything is covered. You can cut the veggies up a bit if you want. Bring to the boil and let it simmer for about 3 or 4 hours or until the meat comes off the bone – I should have started this before 4pm on Monday afternoon. Cook the rest of the leek (the white part) until done in boiling water and set aside. 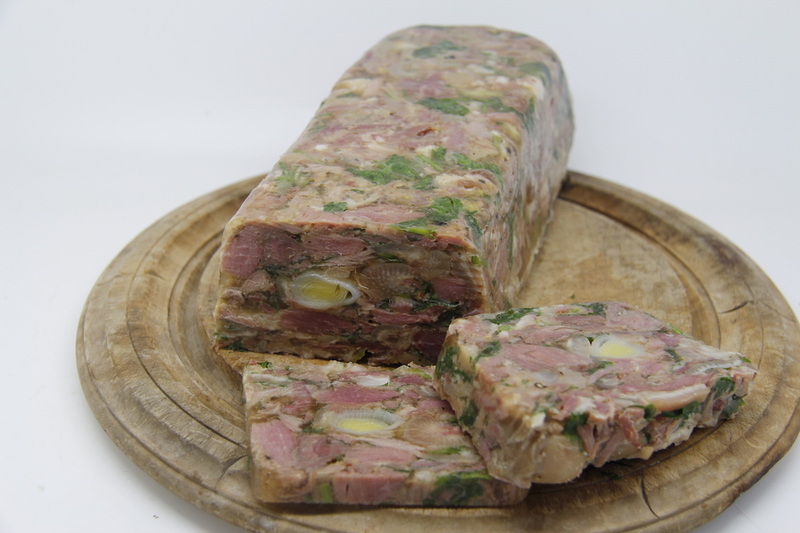 Once the meat is cooked, drain off the stock into another saucepan and then boil the stock hard until it is reduced to about a litre – I had a bit more than that as it was getting late and I wanted to finish the terrine before midnight – it still worked. 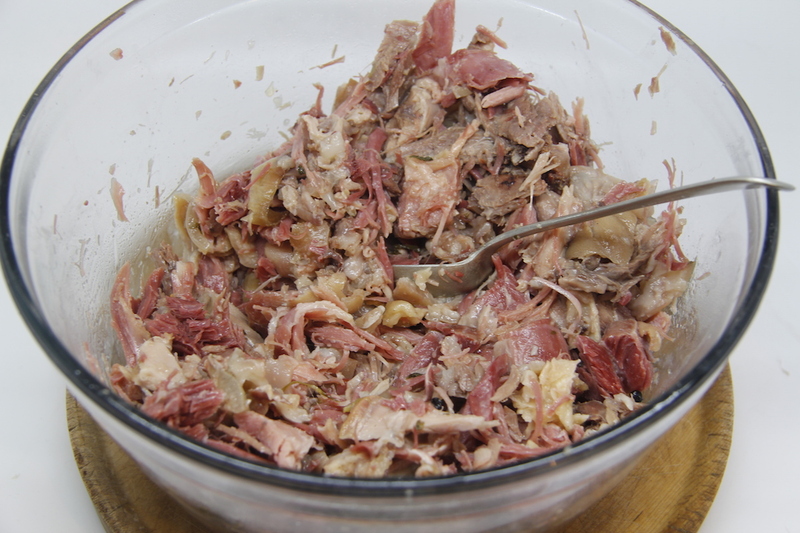 Strip the meat from the ham hocks. You can pick off some of the meat from the trotters – I didn’t bother too much – I did the easy bit – the trotters are mainly there for the jelly. Add your seasonings to the meat – mustard etc. I also used some home-blended quatre épices (basically pepper, ginger, nutmeg, cloves, bit of allspice and some cinnamon – I know this is more than four, but I don’t care). Add in the rest of your chopped parsley. I would have liked to add more, but I didn’t have any more in the garden so used what I had. 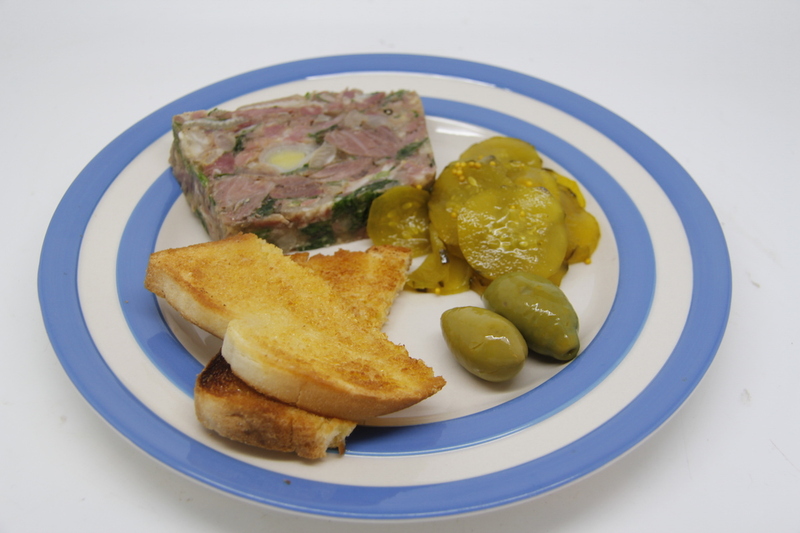 Slice the terrine and serve with toast and pickles – in our case home made sweet pickled cucumber. This is really good. I might experiment with putting hard-boiled eggs in or maybe even smoked eggs. It would be good with other pickled veggies which reminds me I have a recipe to try…..
N.B. In the interests of full disclosure I also tried the pickled walnuts I made a month or so ago with the terrine – see here. Despite pricking the green walnuts to see if the inner a shell had started to form, I think I got them too late as the pickles had a hard woody bit in the middle which was not nice. I will try another batch but mainly I am gutted. I made 12 jars. Oh well, I have learned another lesson – pick the walnuts earlier in the year for pickling. I will be keeping an eye on them next year and will pickle some and let some grow on and hopefully get some nuts! Looks absolutely beautiful, reminds me of my mother’s cooking! Thank you – it tastes good too. Oh my that looks awesome! I must try this!! Do – it is great! Sorry your walnuts didn’t turn out! Btw, who is N.B. ?